Calls for the immediate release of seven imprisoned leaders of the Baha’i community in Iran have come from Australian Foreign Minister Julie Bishop, NSW Education Minister Rob Stokes MP and distinguished international lawyer Professor Gabriel Moens. 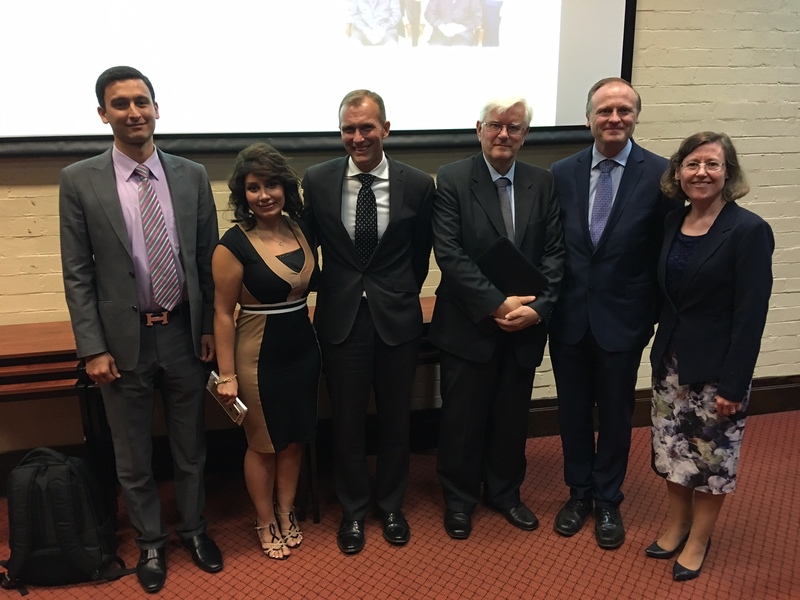 Mr Stokes and Professor Moens condemned the unjust imprisonment of the leaders when they addressed an event organised in Sydney by the University of Notre Dame Law School on 17 May 2017. Other speakers included two adult children of the leaders, and the Dean of the Law School, Professor Michael Quinlan. The seven were imprisoned after a secret trial in which no evidence was produced to justify the absurd charges against them. The General Assembly of the United Nations has repeatedly condemned the persecution in Iran of members of the Baha’i Faith, that country’s biggest non-Muslim religious minority. Mr Stokes said Australians should send a strong message to the Iranian government about its attack on the human rights of the leaders. He said it was his great honour to host in his electorate one of the jewels of architecture in Australia, the Baha’i temple. “It is through that association that I have had the opportunity to meet many Baha’is, and I can attest to the wonderful, loving, peaceful, thoughtful and genuinely other-person centred people I have met. Professor Moens said there is a plethora of international human rights documents that protect the right to freely exercise one’s religion in public and private. The treatment of the seven Baha’i leaders is “an affront to human dignity” which is contrary to international human standards protecting religious belief and religious practice, Professor Moens said. In his remarks, Professor Quinlan asked those attending from diverse religious traditions to pray for the immediate release of the leaders. He said people of all religions share the desire to “live peaceful and quiet lives with all devotion and propriety”. Also addressing the meeting was Negar Sabet, the daughter of one of the seven leaders, Mahvash Sabet, whose poems were smuggled out of prison and appear in the 2013 book, Prison Poems. Now a university student in Australia, Ms Sabet recalled the stress of bringing the poems out from the prison. “When her first book got published, we laughed and cried,” she said. Joining her at the podium was Vargha Bolodo-Taefi, the son of Fariba Kamalabadi, another of the imprisoned leaders who shares a cell with Mrs Sabet. “I consider my mum’s cell a cell of glory,” said Mr Taefi, who now lives in Australia with his wife and baby son. “Why has the Iranian government subjected a group of its most faithful, obedient, capable and innocent citizens to unwarranted scorn and unjustified repression?” Mr Taefi asked. I am saddened to note the ninth anniversary of imprisonment for seven leaders of the Baha’i community in Iran. Australia remains deeply concerned by the human rights situation in Iran and ongoing reports of persecution of minority and ethnic communities, including Baha’is. “We continue to call for the release of the seven imprisoned Baha’i leaders: Afif Naeimi, Behrouz Tavakkoli, Fariba Kamalabadi, Jamaloddin Khanjani, Mahvash Sabet, Saeid Rezaie, and Vahid Tizfahm. We also call for the release of all prisoners of conscience in Iran. Australia continues to express our concerns over human rights directly with the Iranian government and in relevant UN fora. During the 34th regular session of the Human Rights Council in March 2017, Australia issued a statement on the human rights situation in Iran, which, among other areas of concern, highlighted the widespread mistreatment of religious minorities, including Baha’is. At this same Human Rights Council session, Australia also co-sponsored a resolution that extended the mandate of the Special Rapporteur on the human rights situation in Iran. In November 2016 Australia co-sponsored the UN General Assembly Third Committee Resolution on the human rights situation in Iran. This Resolution expressed serious concern, amongst other things, about incitement to hatred that leads to violence against Baha’is. Australia will continue to follow closely the human rights situation in Iran and raise our concerns in both bilateral and multilateral fora. It is the firm belief of the Australian Government that freedom of religion and belief is a core human right, and that this freedom must be respected in all countries.